The most precious thing we have is not money: it’s TIME. 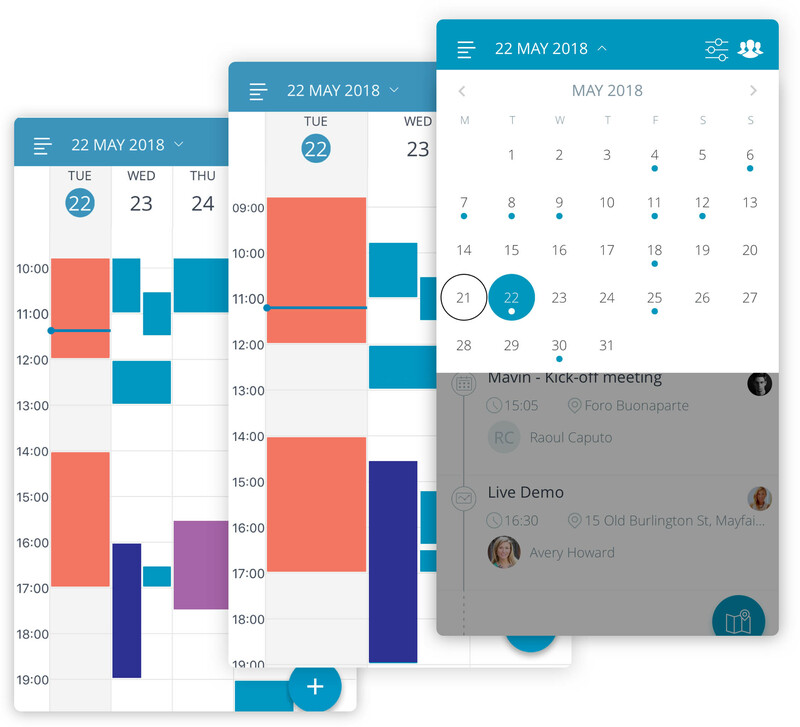 Sellf helps you organize your time, planning your calendar quickly: you can set up a meeting, a call, a demo, or any other type of event, without switching between your mobile CRM and your calendar app. 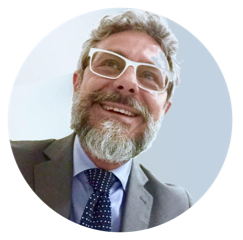 With one tap, you can also perform activities, like sending mails to the attendees and link the event to the deal. If the meeting is at a client’s location, Sellf will automatically show the location on the map and give you driving directions. Share your calendar with your team so people see full event details or just if you are free. 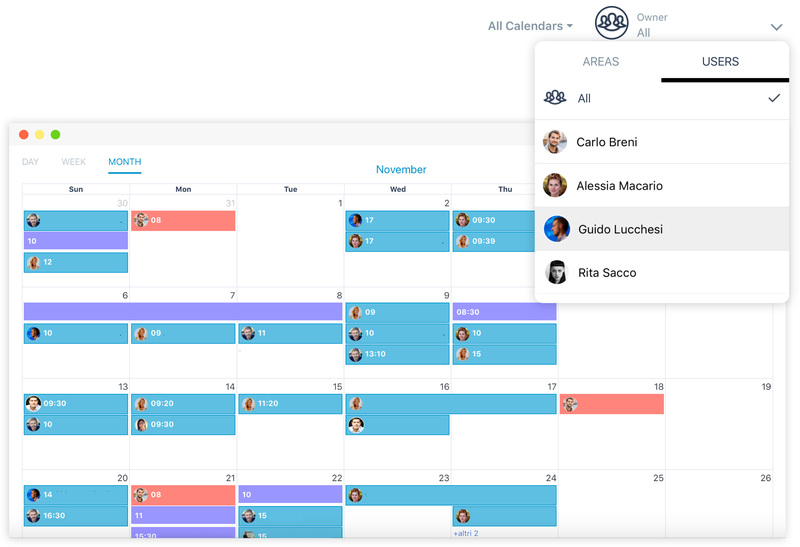 Schedule meetings quickly by checking coworkers’ availability. Add several colleagues and customers to the meeting and instantly send an invitation via e-mail. The event will automatically appear in your team shared calendar. Obviously only you will be able to see your personal events. Of course, you can also keep track of your private meetings by integrating your external calendars: Google Calendar, Exchange, Outlook, Office 365, iCloud. This ensures that you are always updated in every application and avoid scheduling the same meeting twice. Obviously only you will be able to see your personal events synchronized from external calendars. Manage and edit your schedule from any device. Even from smartphones and tablets, you can quickly switch to daily, weekly and monthly views to get a visual overview of what’s going on in your team and find a free moment. See all the details of your events with the agenda view. Enjoy seamless sync across all your devices, your events are stored online, so you won’t lose your schedule if you lose your phone. Never miss an event anymore, thanks to in-app and push notifications. 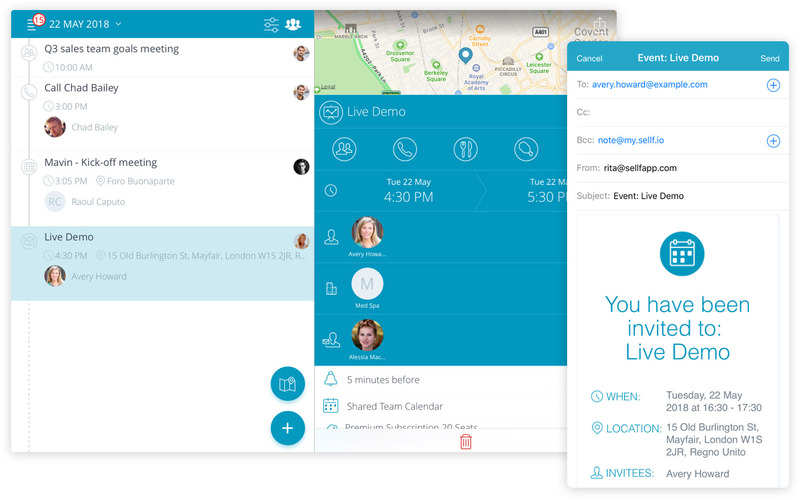 Assign events or invite your collaborators to meetings created in Sellf, instantly send an invitation via e-mail and everyone is up-to-date. Instantly get directions to your customer’s location.